This is a tricky question. The answer is, "it depends." Different users will have different needs when it comes to the dashboard. Finance users may want to keep up with recent gifts and track pledge fulfillment. Marketing users may be more interested in seeing which outbound channels are performing best. Below, we've laid out a guide to all of the available dashboard widgets, including notes on available customizations, interactivity, and recommendations for which teams might be best served by each. 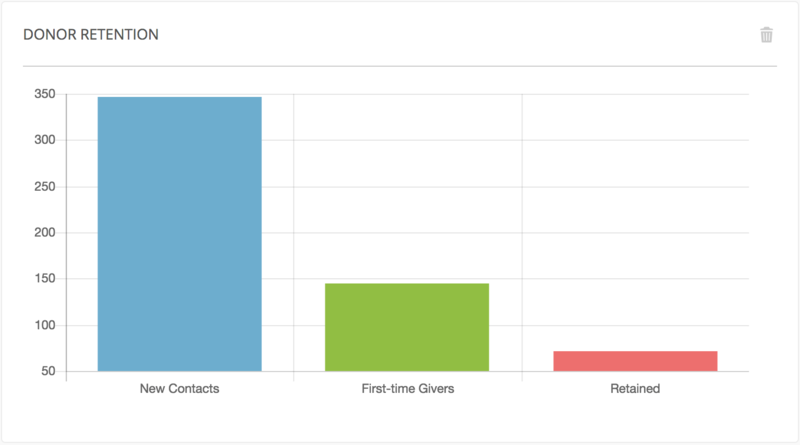 The Donor Retention widget displays current statistics showing how many Contacts were added to the database in the last 12 months ("New Contacts"), how many of them made a single gift ("First-time Givers"), and how many made more than one gift ("Retained"). 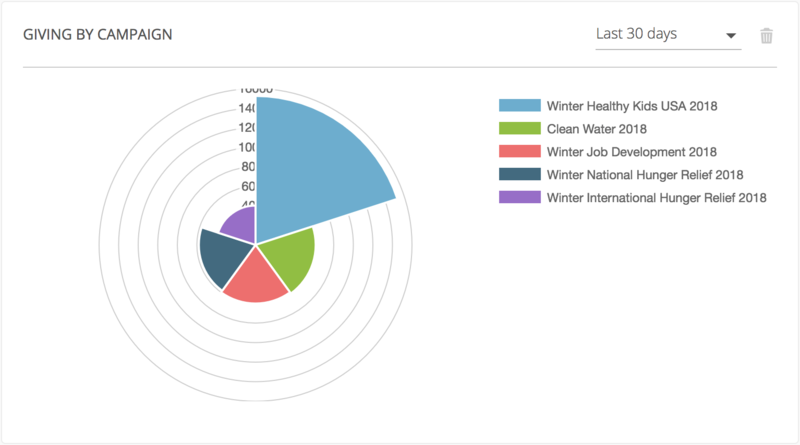 The Giving by Campaign widget displays a visual graph to show the top 5 Campaigns, measured by dollars received, for your organization. Interactive? You bet. Hover over any of the "wedges" on the graph to see actual totals. Click on any Campaign name in the legend to remove it from the graph entirely. The Giving by Channel widget displays a visual graph to show the 5 best-performing Channels, measured by dollars received, for your organization. These Channels are measured across all Campaigns and Communications. Interactive? You bet. Hover over any of the "wedges" on the graph to see actual totals. 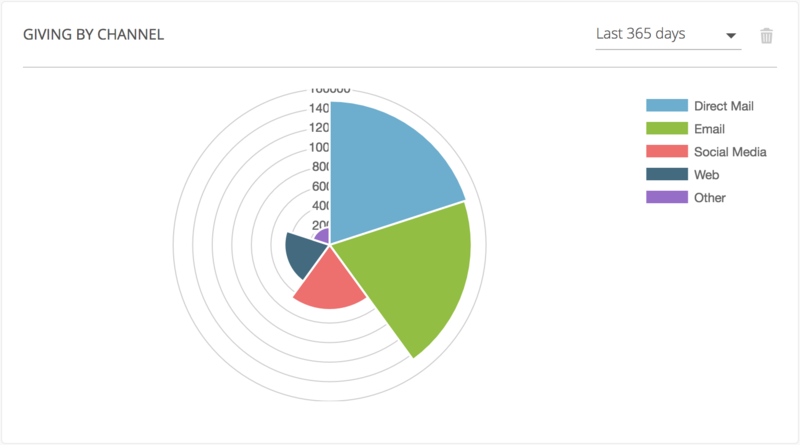 Click on any Channel name in the legend to remove it from the graph entirely. 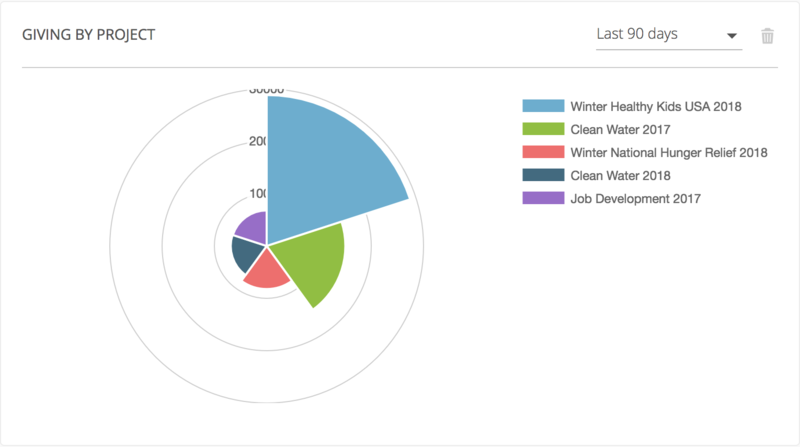 The Giving by Project widget displays a visual graph to show the top 5 Projects, measured by dollars received, for your organization. Interactive? You bet. Hover over any of the "wedges" on the graph to see actual totals. Click on any Project name in the legend to remove it from the graph entirely. The Giving Comparison widget compares the total dollars raised over a recent time period with the equivalent time period immediately preceding it. Put another way, it helps track recent trends to see whether overall giving is increasing or decreasing. Customizable? Yes! 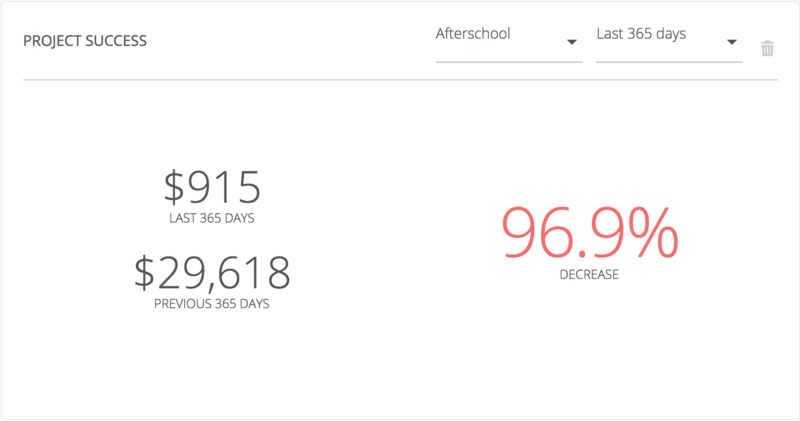 Users can select a specific time frame for the widget, including: Last 30 Days, Last 60 Days, Last 90 Days, Last 365 days, or This Year. Interactive? Not really, outside of customizing the dataset. 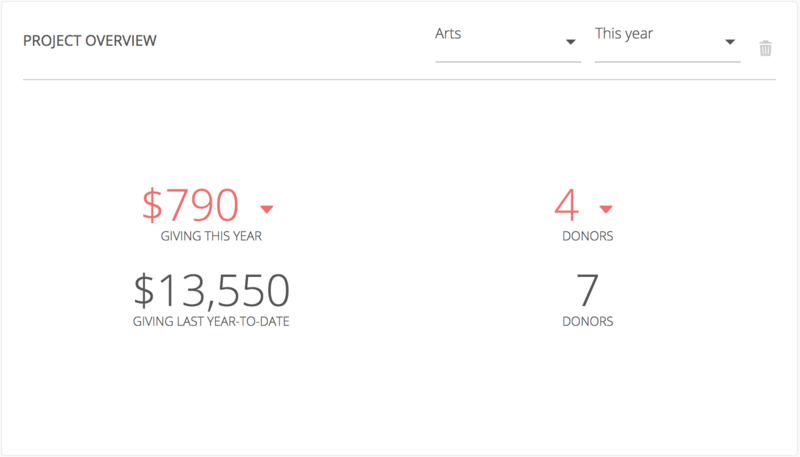 The Giving Overview widget provides a high-level snapshot of overall giving, including the total number of unique givers, for your organization, with a comparison to the previous year's totals for perspective. The Pledge Fulfillment widget shows the difference between the amount your organization expects to receive each month based on Pledge commitments versus what is actually received in Pledge payments. The data is shown for the most recent 12-month period. Interactive? Sure! Click on the "Expected" or "Received" items in the legend to remove one or the other from the graph. The Project Goal Overview widget displays the current amount raised for a specific Project vs. the Financial Need Amount for that Project. Financial Need Amounts may be expressed as fixed amounts (i.e., this Project needs to raise a total of X dollars to be successful) or as ongoing needs, with monthly, quarterly, or annual targets. The widget is based on the Need Amount frequency for the selected Project. Projects with a fixed amount will display totals over the entire Project duration, while a Monthly Need amount will display the current month-to-date total and the target amount. Customizable? Yes! Users can select a specific Project to use with this widget and a specific time frame for the widget, including: Last 30 Days, Last 60 Days, Last 90 Days, Last 365 days, or This Year. 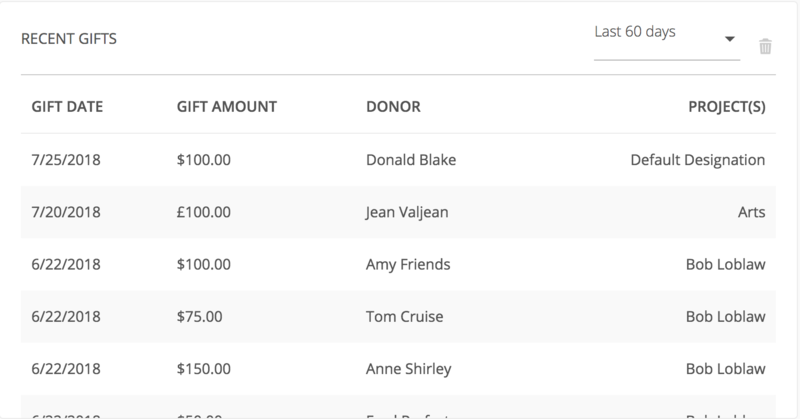 The Project Overview widget displays the current amount raised and number of unique donors for a specific Project over a recent time period with the equivalent time period immediately preceding it. 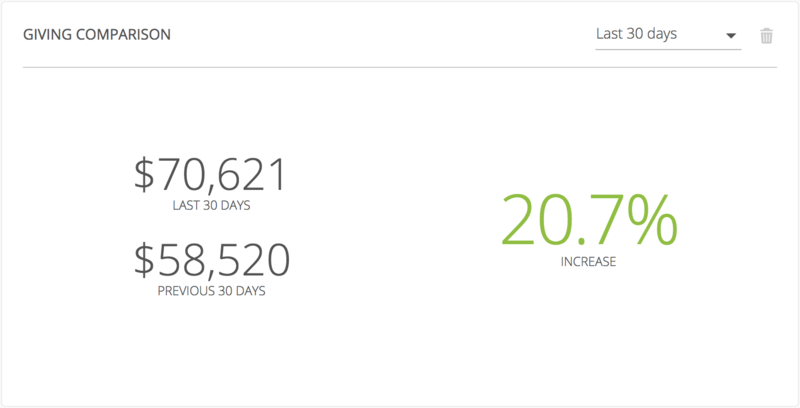 Put another way, it helps track recent trends and benchmark against past performance. The Project Success widget displays the current amount raised for a specific Project over a recent time period with the equivalent time period immediately preceding it, as well as the percentage increase or decrease between the two. Put another way, it helps track recent trends to see whether overall giving is increasing or decreasing. The Recent Gifts widget displays a list of all recent Gifts to your organization, in reverse chronological order. The data displayed includes the date, amount, donor name, and the Project designation. 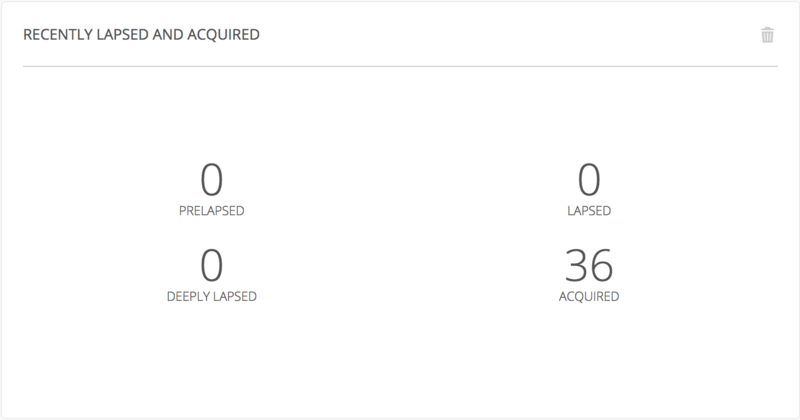 The Recently Lapsed and Acquired widget provides totals for the number of Contacts who have lapsed or ben acquired within the last 30-day period. Acquired donors are those who have made their first gift. Per-Lapsed donors have not given a gift in the last 6 months, Lapsed donors have not given a gift in at least one year, and Deeply Lapsed donors have not given a gift in at least two years. This data can be used to track churn within your donor population. 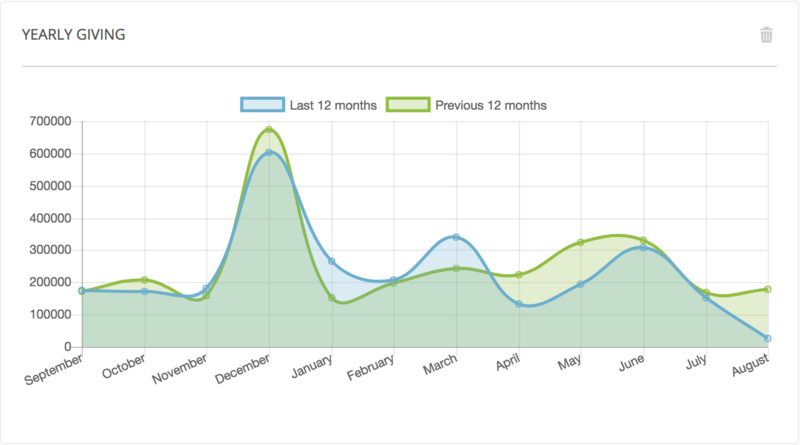 The Yearly Giving widget displays monthly fundraising totals for the last two years, providing a view of long-term trendlines in your organization's giving. This data can be especially helpful when planning and setting fundraising goals. Monitoring these trends can also alert staff to potential drop-offs in performance that need to be addressed. Interactive? Sure! Click on either of the blocks in the legend above the graph to remove one year or the other and viewdata for a single year.